JLogin provides you with single sign-on and seamless authentication capabilities from your internal network directly into the JLMS Enterprise platform. It allows your learners to simply click a link on the Intranet to access their training plan or even launch directly into an elearning course. JLogin can be deployed in simple mode where we pick up the learner's network ID from the Intranet page, or it can be integrated with your ADFS system. The JLogin software provides for easy one click access to training using the concept of single sign-on. It allows users to simply click a link on the intranet to access their training plan without having to login again. Alternatively, JLogin can be configured to provide single click links to online courses on your intranet. 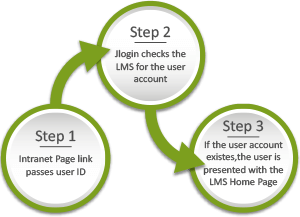 One click from the users and they are logged into to the LMS, and the course starts immediately.